Does anyone have a CP/diagrams for a tesselation mask by Joel Cooper ? I already knew that that one. Why can't you just use that one then? Harpseal wrote: Why can't you just use that one then? search the forum. this has been discussed already. cooper has not released any other cp, they would take too long. 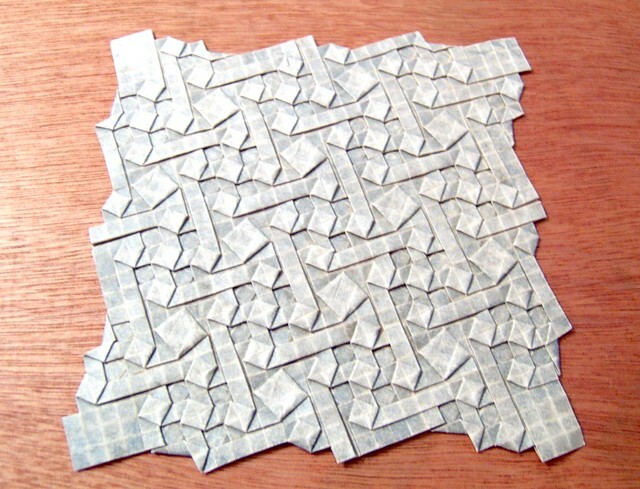 Even though its one of his simpler works (for his grade of origami tessellation complexity anyway), Im ready for another challenge. PM of which mask you want reverse engineered, and Ill see what I can do. "Violence isn't the answer but it's always a good start." Thats Joels original design and photo, I have yet to post photos because of a "camera crisis" at home, but I may be able to make a cp, with Joels permission. my flickr tissue foil is for noobs! mc FTW!!!! Getting his permission. Easier said than done. Actually, I just got his permission to make a CP for the piece mentioned above. ooh, that's really good, now get his permission to share the cp.